The perfect protection pack for your iPhone. A three-piece bundle including the Crystal case and two glass screen protectors. Crystal case + 2 glass screen protectors. 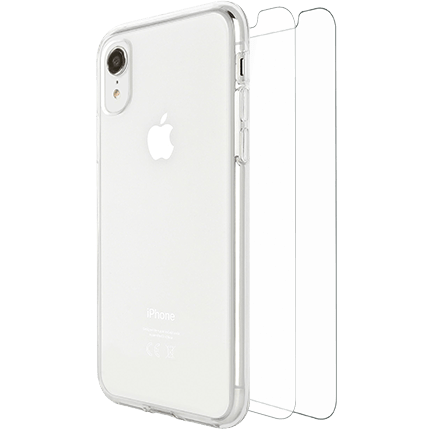 This three-piece bundle includes a Crystal case and two glass screen protectors, giving you 360 protection for your iPhone, securing both the front and the back. The Crystal case provides shock absorbent protection along each side with a tough, durable back. It’s completely transparent too, so you can still show off your iPhone. The Crystal case is proven to keep your phone protected, from drops of up to 3 metres. So you can avoid those heart-in-mouth moments. With enhanced button protection, the Crystal case even keeps your buttons safe from drops and bumps, keeping the whole of your phone looking newer for longer. The 360 Pack includes a raised front screen rim, meaning your screen will be safe from scuffs and scratches, even if you drop it face down. And the screen protectors use tempered glass, for ultimate screen protection.